Long, long ago -- when the stories in our books take place -- there were no dogs on Planet Earth. When dogs first came down to Planet Earth they were often met with hostility, fear and even aggression by ordinary people. You can’t blame them for reacting in this manner for not only had many good people forgotten how to love, but they lived in world of danger and uncertainty…their land and their lives were being threatened by invasion from cruel warrior tribes. After all, they had left their own planet, a place where they lived in peace and happiness, and come down to earth to help people. Yet they were often met with fear, wariness, and outright rejection. This alone would discourage most humans. Somehow, dogs being dogs, they didn’t give up on humans…they had made a commitment to help us, and they did so. From Green Valley to the land of the Forrest people, and from Sun Valley to Santa Claus Village in the Far North, the dogs worked with children, farmers, healers and elves to teach love, forgiveness…and to bring peace to the land. All the children in our books understand the dogs and they are able to help the adults understand. Children who read our books can imagine all the struggles that the dogs must face, and the obstacles that they overcome. And so our readers can be entertained, their imaginations can be stimulated, and they can visit a world where non-violence, loyalty and love, help to create happier lives. In the world today, good people must struggle to find peace, security and happiness. In the world of our books, people must also struggle to have a good life. In our books however, there is always hope -- in the form of wonderful teachers who wag their tales. There are many dog sites on the Internet, but I have yet to see anything that quite compares to the Nebraska-based blog: Way Cool Dogs...Written by Nancy L Young-Houser and co-writer Sandra S Marquiss, and continually updated with interesting, relevant dog information, it's also home base for a dog rescue farm and Nebraska Pets Meals On Wheels. "Way Cool Dogs is a daily blog full of dog information, coming at you from Central Nebraska on all four furry little feet! Our daily dog blog involves funny stories from…the viewpoint of a very busy little dachshund named Miss Holly Higgins; lots and lots of photographs and videos; dog jokes; dog health and research related articles; dog product reviews; and up-to-date dog news and information… we even share the limelight with cat stories, jokes and a few photographs! We started NE PETS Meals on Wheels with a hub of volunteers throughout the state for struggling Nebraska families and individuals who have pets and have lost their job, are elderly, have health problems, or are disabled." Planet Of The Dogs hats, t-shirts, mugs etc are in our Cafe Press Shop. If you're 50 years old or younger, give every book about 50 pages before you decide to commit yourself to reading it, or give it up. If you're over 50, which is when time gets shorter, subtract your age from 100 - the result is the number of pages you should read before deciding whether or not to quit. If you're 100 or over you get to judge the book by its cover, despite the dangers in doing so." We learned of this through Way Cool Dogs..."
"Raising the awareness of the need to adopt shelter dogs, the U.S. Postal Service has issued ten new 44-cent stamp designs for Animal Rescue: Adopt a Shelter Pet. The photo was taken in Julie Hauck's third grade class in Sheboygan, WI where her Pages for Preston program has had great success. We have become very appreciative of Alice Berger’s reviews – concise, grounded, caring, and purposeful. And so it was that we decided to follow up on her book, Who’s Taking a Bath. We asked three of our grandchildren, two boys and a girl, ages 3 to 10, to help us review this whimsical book about taking a bath. Their reactions were all very positive, and accompanied by smiling faces…If only she would write about dogs. http://bergersbookreviews.wordpress.com. “One of the absolute joys in owning a bookstore is the kids. I’m especially fond of three-and-four-year-olds who have embraced reading to such a degree that want to share their newfound love with everyone, including stuffed animals. We have a bin of stuffies (as some kids call them now) in the picture book section that kids love to go through. Often the kids will just play with the toys, but every once in a while I see them carefully setting up the toys with books in their little stuffed laps. The care, and almost reverence, this little boy has with books was so touching. He wanted to share his love of story with anyone who would listen, and in our busy store it meant dragons. At his house, I’m sure the dog gets many books set out by his bed. Finn’s behavior speaks to a household that loves books. He sees both parents, especially his stay at home dad, reading all the time. He is read to constantly. This simple act, sharing a story with a child, has an amazing ripple effect. These parents have grown a reader. And in turn, our stuffed animals have a reading buddy. " "Have you ever noticed certain similarities between your father and, say, a lab or golden retriever? Many dads have a whole lot in common with friendly, lovable, sometimes barky dogs. Dads and dogs can be so similar, in fact, that the young narrator of My Father the Dog is suspicious. My father pretends to be human, but I know he is really a dog,...Consider the evidence." "I am organizing an event called "Paws For A Cure" on October 2, and it benefits the Susan G. Komen Breast Cancer Foundation and 3Day Walk. It is a fun pet show with about 12 different categories. This is the 3rd year the event will be held in Jackson, TN, at Liberty Garden Park. Last year we raised over $2500.00 for breast cancer. Please check out some of the pictures (Amanda Johnson Photography) from last year's event(one is posted on the left and another below)) at http://www.pbase.com/mctodd/2009_paws_for_a_cure. I have done many different events for breast cancer, but the 3Day is the most special to me. In October of this year, I will walk 3 days traveling 20 miles a day with thousands of other people. Each participant of this walk must raise a minimum of $2300.00." In the wonderful Andrew Lost series of educational science books for young kids, author J.C. Greenburg writes about the adventures of Andrew Dubble, who "has been inventing things since he was four. His first invention was the Whoops Eraser. It was supposed to get rid of stains. But it also got rid of the things that had the stains...Andrew is ten now. Today he's trying out his newest invention, the Atom Sucker." 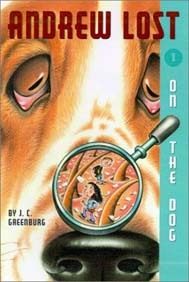 Thus begins a fantasy journey, that entertains and teaches science when Andrew, Judy and Thudd (an Ultra-Digital Detective robot) are shrunk by the Atom Sucker and find themselves on the nose of Harley, the basset hound. Their micro- journey on Harley is fast moving and fun, yet filled with science and learning. There are many, many booklists for kids...however, Caitlyn Cole, a reader of this blog told us of one which we want to pass along -- it's very good. http://www.onlineuniversities.com/blog/2010/07/101-books-that-hook-kids-on-reading...Thanks for this, Caitlyn. "The fulfillment you get from helping these pitiful animals is priceless, and it is easy to do"
Deborah Eades-Every Rescued Dog Has A Tale, Stories from the Dog Rescue Railroad.